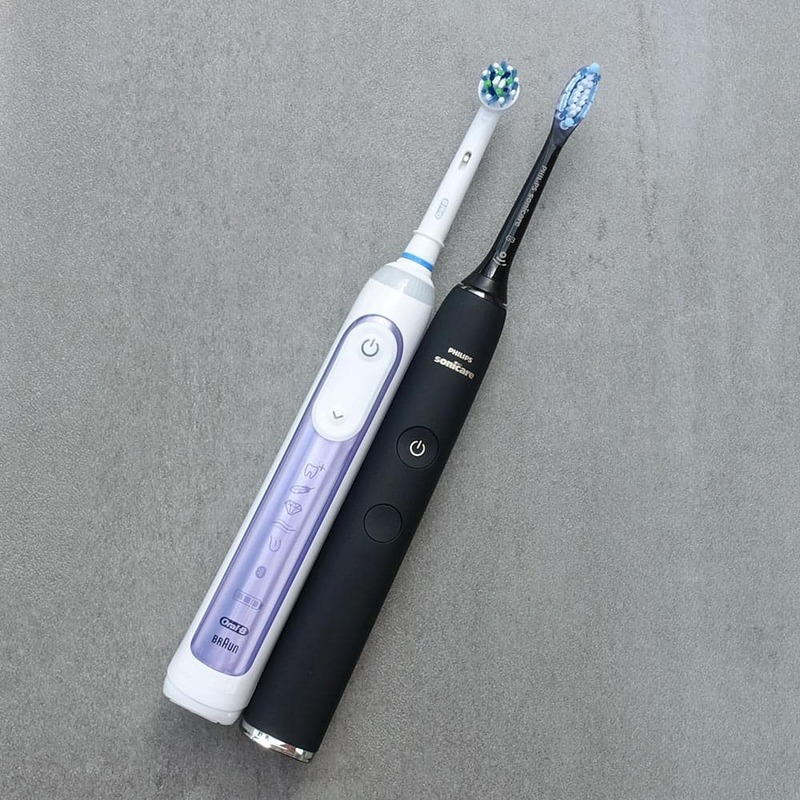 Two excellent electric toothbrushes that demonstrate innovation and encourage users to be better at looking after their oral health, these are the flagship brushes from two of the major brands within the electric toothbrush market. Unsurprisingly they both feature in our list of recommended brushes for 2019. For the most part in day to day use the Sonicare DiamondClean Smart is the better brush. Undoubtedly extra value is built into the DiamondClean, but a selling price of twice that of the Genius 9000 is a bitter pill to swallow to gain the benefits offered and subsequently stops it from being our recommendation. The Sonicare DiamondClean uses sonic cleaning technology, whereas the Oral-B Genius 9000 uses oscillating-rotating-pulsating technology. Different design and colour options for both models. The Genius 9000 is easier to grip whilst the DiamondClean Smart is more premium looking. Slight variation in size. The Genius 9000 has 6 cleaning modes (Daily Clean, Gum Care, Sensitive, Whitening, Deep Clean and Tongue Clean) whilst the DiamondClean Smart comes with 5 (Clean, White+, Deep Clean+, Gum Health and Tongue Care). The Sonicare DiamondClean offers 3 brushing intensity settings. Both brushes come with 4 brush heads. Different styles and motions. The DiamondClean Smart comes with 1 x Premium Plaque Control, 1 x Premium Gum Care, 1 x Premium White and 1 x TongueCare+ tongue brush) compared to the 1 x CrossAction, 1 x FlossAction, 1 x Sensitive and 1 x 3D White with the Genius 9000. When attached each brush head will automatically change the cleaning mode on the Smart, a feature not available on the Genius 9000. The Smart will alert when it is time to change a brush head, not available on the Genius 9000. The DiamondClean Smart has a better implementation of a premium travel case. The DiamondClean Smart comes with a glass charging stand compared to the plastic charging stand with the Genius 9000. The Genius 9000 comes with a smartphone holder, the DiamondClean does not. The DiamondClean Smart comes with a bottle of antibacterial spray. The DiamondClean Smart offers better battery life. 3 weeks compared to 12 days. The Genius 9000 gives more feedback from the battery than the DiamondClean Smart. The Genius 9000 has an LED Smart Ring the DiamondClean does not. The Genius 9000 comes with a brush head storage compartment for 4 brush heads. Only the DiamondClean Smart HX9954/53 comes with a brush head storage compartment for 3. The DiamondClean Smart has automatic power off and Easy Start features the Genius 9000 does not. The DiamondClean Smart is quieter. The Genius 9000 has up to 3 years warranty, compared to the 2 years of the Sonicare. The Genius 9000 is around half the price of the DiamondClean Smart. Please note, that as of March 2019, Sonicare have added another variant to the DiamondClean Smart range. The 9100 is a more cost effective model than the variants originally launched in 2017. It lacks the tongue cleaning mode, does not have a travel case included, comes with just 1 brush head in the box and no brush head storage compartment. This comparison focuses on the more heavily marketed variants that offer the likes of a travel case and extra box contents. Detailed Comparison: What’s the difference between the Oral-B Genius 9000 and the Sonicare DiamondClean Smart? The premium models from the respective brands, both of these brushes offer a lot. In all honesty, for the vast majority of users they offer more than you need and may be prepared to pay for. However, if you want the best, then these are two brushes you should be considering because they represent the future and the latest innovations within oral health care. 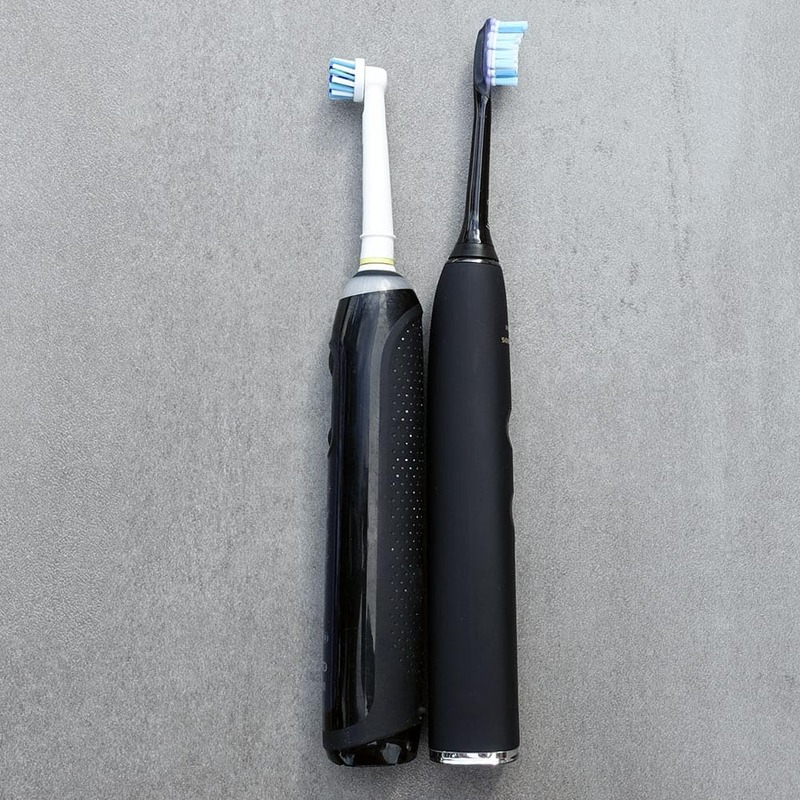 We have often found when comparing equivalent models between these two brands, Sonicare tend to be the more premium feeling and priced, with Oral-B offering more often than not, more features for less money. The pattern continues here with the DiamondClean Smart and Genius 9000. Natural tendency can be to go for the ‘cheaper’ option, but sometimes that is not always the best decision long term. We discuss price in detail later in the comparison, for now, let us show you in detail the differences between these two models. To start with, let’s explain the models. There are 3 variants of the Genius 9000. The box contents is the same, the only difference is the colour. It is available in white, black or rose gold. With the Sonincare there are 4 variants, 2 which share the same box contents, but differ in colour and the other comes with an extra in the box and available in a different colour. As you might expect from a design perspective they look a bit different although the overall shape, size, weight and in hand feel is similar. Both offer a handle with detachable head based around a cylindrical form factor. Our preference is from a looks perspective, the Sonicare. It looks classier, more premium. The colours are rich and the materials feel good to the touch. It feels reassuringly well built and fitting of its price tag. The Genius 9000 is not as premium looking, but more practical. There is a length of rubber down the back of the brush handle and the buttons provide a bit more feedback. To be fair the Genius isn’t the ugliest brush we have seen! Sit the DiamondClean Smart within the modern designed bathroom and it will look more at home than the Genius 9000, but at the end of the day the job is to brush your teeth and few go parading their toothbrush about, so it does not make a great deal of difference in how it looks. Sonicare wins it for styling, Oral-B wins it for everyday in hand practicality. That said, the Sonicare has some nifty tricks built in which do affect your everyday use in a very positive way. Not required for all, but one feature is an Easy Start programme, which can be set to gradually increase the power of the brush over a fourteen day period. If you are coming to an electric toothbrush for the first time, the additional power and motion can feel odd and take some getting used to. The Sonicare can essentially ease you into the brush and make a transition from manual to powered that little bit easier. Both brushes have built in timers to ensure you brush for the right amount of time, but at the end of the typical 2 minute clean, the Genius 9000 keeps on going until you turn the brush off. The DiamondClean Smart on the other hand just automatically switches itself off. We prefer this. You can always turn it back on again, but it really signals the end of the clean and conserves battery life. Kind of a progression from the Easy Start is the functionality on the DiamondClean Smart to change the intensity at which the brush operates at. Each cleaning mode available on the DiamondClean operates ‘best’ with a particular brush head and a particular brushing intensity. However, you can choose whether you want the most power the brush can handle or whether you want the motor to step down the power delivery to offer a softer clean. You have three settings, low medium and high which are highlighted on the brush handle via three illuminating bar icons in between the power and cleaning mode buttons. The Genius 9000 does not offer this, each cleaning mode is set to a certain power output. It might not be a feature you need, but it can be good if you are suffering from a little sensitivity in the teeth of gums or really want to get the best clean you can by getting a bit more from the brush motor. The brush heads on either brush are interchangeable with a range of styles offered by each brand. Both offer different brush heads which are perhaps better suited to particular cleaning modes and goals of the user. For example, there are those heads and cleaning modes designed for sensitive teeth and gums and those designed for achieving whiter teeth. Any of Sonicare’s brush heads can be used on any of their cleaning modes at any power intensity. It is the same situation for Oral-B. However, the DiamondClean Smart has a bit of a trick built in. Inside the DiamondClean’s brush heads are microchips. When fitted to the brush handle, the ideal cleaning mode and intensity is set automatically. Fit the Gum Health brush head and the Gum Health mode is selected. It goes further too. The brush handle in conjunction with the head tracks how often and for how long the head has been used and will, when appropriate, alert you via a LED on the brush handle that it is time to replace the brush head. Very clever, this is a small but innovative feature that makes the DiamondClean Smart that little bit more desirable. However, this innovation comes at a price. The brush heads are ridiculously expensive and Sonicare have had to develop new heads for the DiamondClean Smart. You can use the cheaper brush heads that other Sonicare models use on the DiamondClean Smart, but the brushing modes will not be automatically selected. You can also use the new brush heads on other Sonicare brush handles, but unless they have the BrushSync mode pairing (most don’t) then there is little point. At this time, the added convenience comes at a hefty inconvenience on your bank balance. If purchasing the newer HX9901/14 variant of the DiamondClean Smart, you get just 1 x Premium White brush head only. The Genius 9000 comes with its equivalent brush heads supplied, there are four of these. Sonicare do offer the Tongue Brush head, but Oral-B suggest and our own research confirms, that a regular brush head can be just as good. With the Genius 9000 comes a brush head storage compartment. A basic affair it is a plastic tray with a lid that holds up to 4 brush heads. It is functional and does the job, protecting the heads from dirt and grime when not in use. Of the 3 variants of the DiamondClean Smart it is only the HX9954/53 that comes with a brush head storage compartment capable of holding 3 brush heads. It looks smarter but is a bulkier implementation. Sonicare’s HX9901/14 variant of the DiamondClean Smart, does not include the tongue care mode. The Genius 9000 tops this with six. The difference between each of these cleaning modes is the amount of time they last for, how much power is delivered to the brush head and the number of movements the brush head bristles makes per minute. As you can tell from the names of the cleaning modes, they are essentially equivalent. Sonicare do not have a ‘Sensitive’ mode as this speed/motion is essentially achieved via the Gum Health mode. With either brush, you have a separate button on the brush handle that can be pressed to change the cleaning mode. When selected the relevant cleaning mode is lit up on the handle of either brush, with one exception. The Genius 9000 does not have an icon for the standard Daily Clean mode, which is the default cleaning mode. We have always found this odd. So it is a case of knowing, if the brush is on but no light is illuminated, that is the mode it is set to. 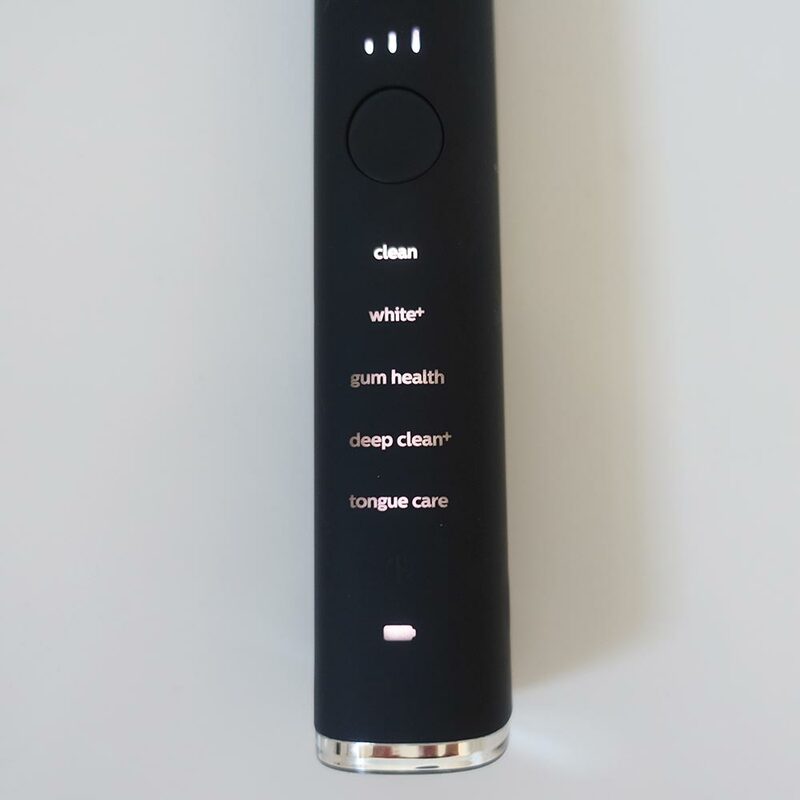 A small box contents difference is that the DiamondClean Smart comes with a bottle of antibacterial spray included, this is designed to be used with the tongue cleaning mode and brush head. When in use the motors inside the brush handles have a tendency to vibrate. When holding the Sonicare handle you tend to feel this more than the Genius 9000, but you get used to it. The 9000 is though a bit louder. If used at night when others are sleeping, you will likely want to close the bathroom door when using the Genius 9000, this is not necessarily essential with the DiamondClean Smart. 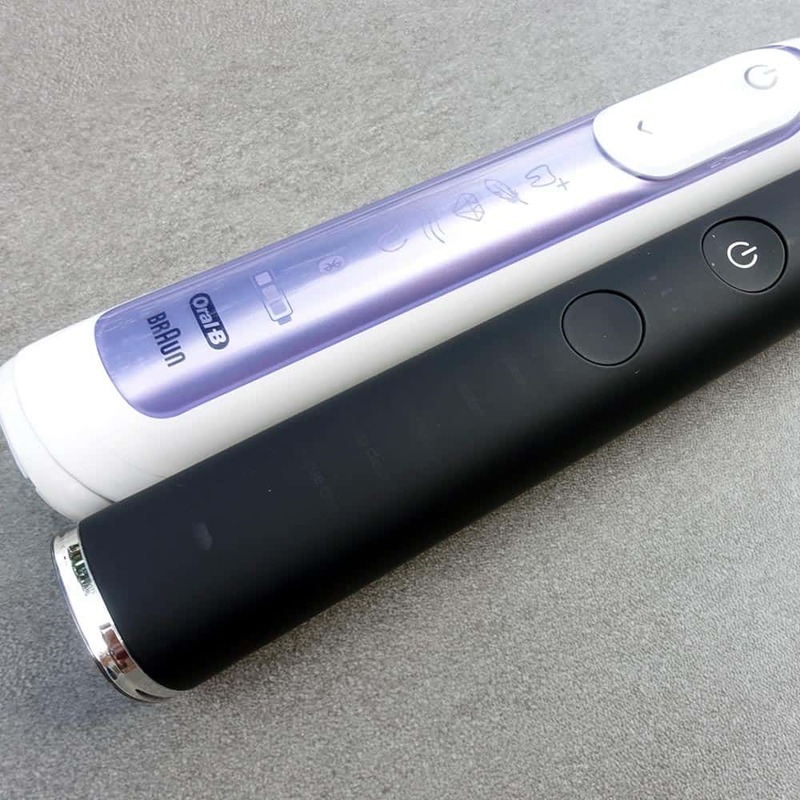 Powering the motor is the lithium-ion battery that is built into both brush handles. The Genius 9000 offers a maximum of 12 days of battery life compared to the DiamondClean Smart that offers double that. The Sonicare actually achieves 25 days of usage time, based on 2 cleans per day for 2 minutes using the standard clean mode. Considering the negligible form factor differences between these brushes the DiamondClean battery is much better. However, the Genius 9000’s battery status icon is broken down into 3 bars, giving a little more feedback in terms of available power than Sonicare’s single bar battery icon, that only changes colour to yellow when at approximately 10%. 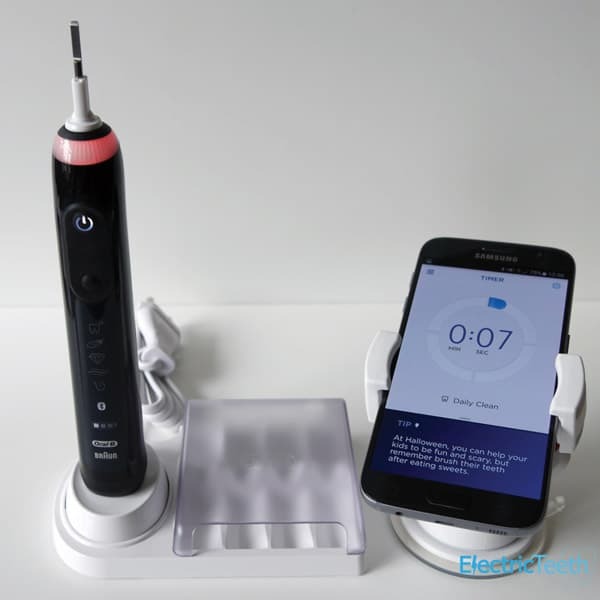 Both brushes offer Bluetooth connectivity allowing the brush handle to communicate with your smartphone via an accompanying iOS and Android application. For all intents and purpose, the apps work in a similar way and aim to achieve similar results. Our preference is for the Sonicare app overall, it appears to work a bit better. However, with respect to Oral-B, a once less reliable app has been greatly improved. Both log and give real time feedback and advice on your clean. Both handles have sensors built into them that detect the position and orientation of the brush as well as your brushing motion. 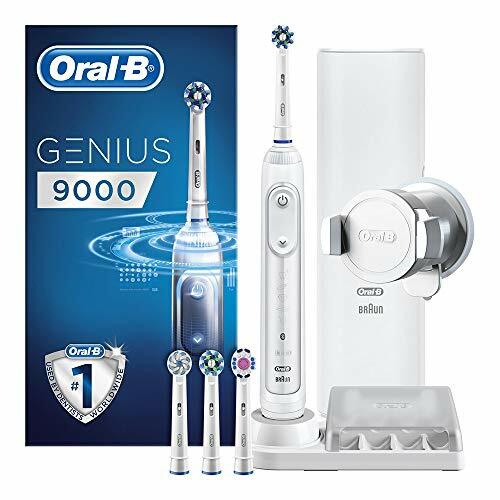 The Genius 9000 has something referred to as enhanced motion tracking which uses the camera on the front of your smartphone to detect and watch your brushing to give the most accurate feedback. Overall the idea is sound but in everyday use it is impractical, leaving us preferring the slightly less complicated setup offered by Sonicare. Supplied with the 9000 is a suction cup smartphone holder which is designed to be attached to a wall or mirror within the bathroom. Dock your phone in it like you would in a car for navigation and stand in front of it so the camera can see you. Innovative for sure, but it all adds to the hassle of cleaning your teeth. You have to stand pretty still whilst also having this mount stuck to your wall. However kudos to Oral-B for including some sort of stand at all. Sonicare do not. Therefore you need to hold the smartphone if you want to use the associated app. With either, it is not essential to use the app at the same time as brushing, both will store cleaning data for a good few cleaning sessions, but it defeats the point a bit. Oral-B actually do a better job of encouraging you to at least use it. Brushing too hard can be detrimental to your oral health so both brushes have pressure sensors built in. If using the app, it will tell you on screen to reduce the brushing pressure, but both of these two have an LED built into the brush handle that lights up when activated. 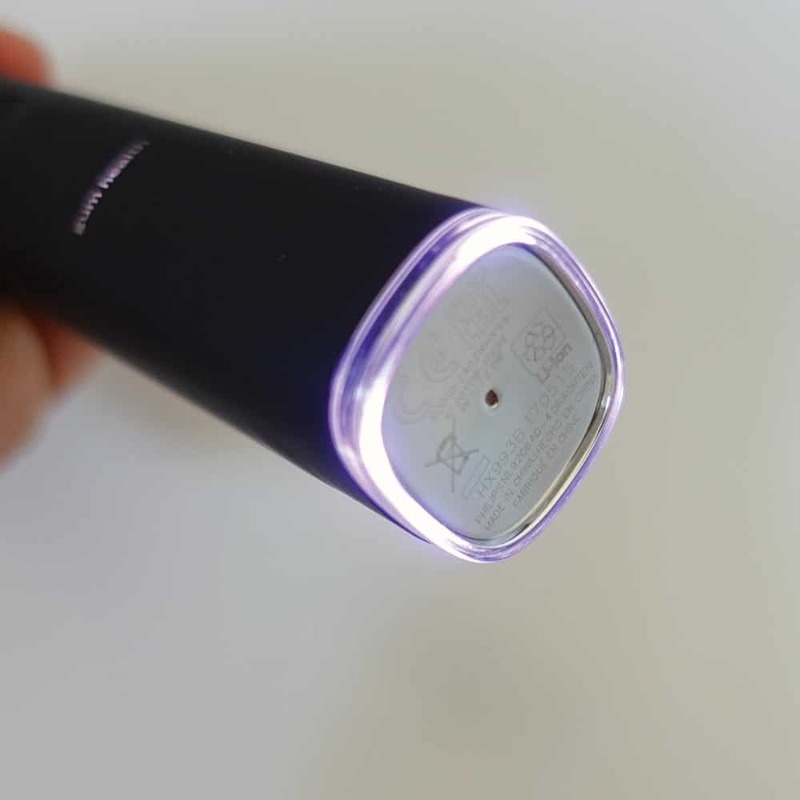 On the Sonicare this is a purple light emitted from the bottom of the handle. A red light comes from the neck of the handle on the Genius 9000. Oral-B’s light is brighter and more obviously placed than Sonicare’s. Sonicare have done quite a poor job here. The neck of the Genius 9000 has what is known as the LED SmartRing. A circular strip that can be lit one of 12 colours, customised via the smartphone app. The DiamondClean Smart does not have this. The LED ring on the bottom ofitss brush handle is a similar principle but only lights up when the pressure sensor is activated. The light colour cannot be changed and there is no way to have the light always on as you can with the Genius. Both brushes come with two ways in which to charge the brush when it needs more power. The Genius 9000 comes with a more traditional charging stand and a travel case in which the brush can be charged. The Sonicare DiamondClean Smart has a charging glass and travel case in which the brush can be charged. More stylish but bulkier the charging glass looks like a tumbler you might have a stiff drink from. 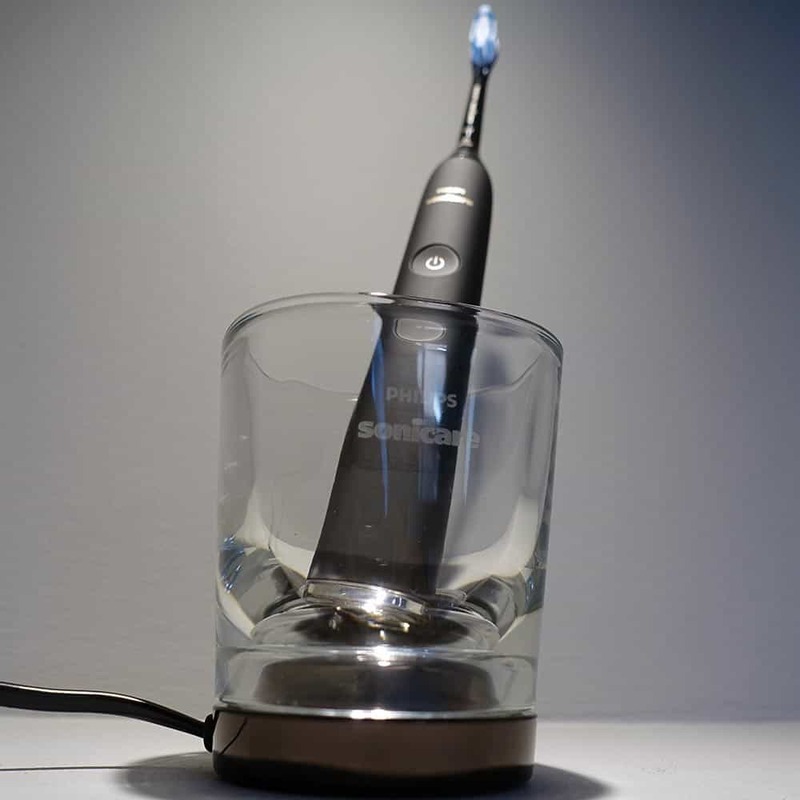 The brush sits in the glass at an angle and uses the same inductive charging technology as the Genius 9000 does sat on it’s stand which has a prong that fits into the base of the 9000 to sit it upright. The 9000 takes up to 12 hours to be fully charged whilst the DiamondClean Smart can take up to 24 hours. Both charging stands have a 2 pin power connector that connects to a 2 pin bathroom socket. The Genius 9000 supports 220-240V compared to the Sonicare which has a more internationally accepted 100-240V support. With either brush the travel case is of a premium construction feeling solid and robust in hand. Both have a soft touch finish. Coated in leather is the Sonicare case, Oral-B’s is finished in a synthetic rubbery feeling material. Holding the handle and up to two brush heads the DiamondClean Smart’s case is better in that hard wired into the base is the charging cable that can be accessed and unwound to offer a USB connector that can be plugged into a mains socket, power adapter or computer’s USB connection. The Genius 9000 on the other hand has a proprietary charger that supports 100-240v and connects to a 2 pin socket. 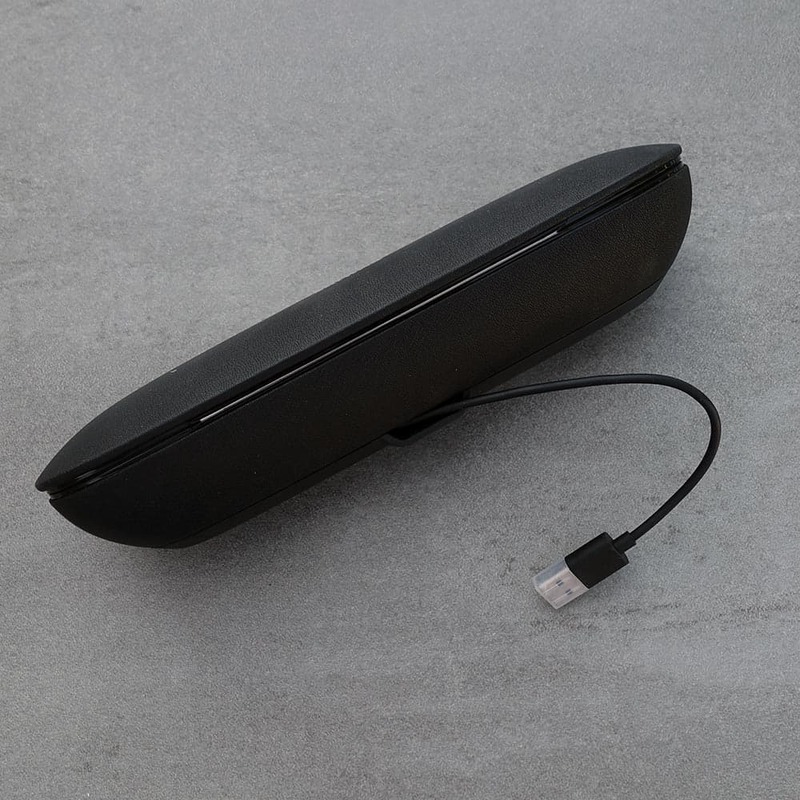 In its favour the case does have a stand for a smartphone built in as well as a USB port into which you could connect a device such as your smartphone for charging. The case must be connected to mains power to charge the brush and connected USB device. Lastly the brushes come as standard with a 2 year warranty out of the box. Oral-B however win in the satisfaction game because this can be extended to 3 years by going online by registering the brush. There is no additional cost. If you asked the respective brands directly, they would each suggest their model does. Studies have shown that the rotating-oscillating technology, as used by Oral-B generally speaking, have the edge here. This is because the smaller brush head size and the motion it has results in greater improvements of users oral health than a Sonicare model. This is however under clinical study conditions and in real world use, both offer an excellent clean. Our general preference is for the Genius 9000’s clean. We come away feeling cleaner after use. It is a bit more of an aggressive clean or so it feels, but the Sonicare is by no means bad. This will really be personal preference and only if using side by side will you really notice any significant difference. If one of these is to be your first electric toothbrush, either will offer significant benefits compared to a manual brush. Any user will benefit most from ensuring they are adopting the right brushing technique with an electric toothbrush than choosing between Sonicare or Oral-B. There is at the time of writing, a considerable difference between these two models in terms of price. The Genius 9000 has a recommended retail price (RRP) of £280 whilst the Sonicare DiamondClean has an RRP of £360-380 (subject to variant). Approximately £100 different, if both brushes sold at RRP, it would still be a real stretch to suggest the Sonicare was the better buy. If we had to put a figure on it £40 is probably the maximum ‘premium’ we would be prepared to pay to get the Sonicare over the Oral-B. In all reality, the actual premium should be no more than £25. But, the situation is that the actual price difference is nearer £200. The Genius 9000 typically sells for £150 less (of course this is subject to change) whilst the DiamondClean Smart sticks at the RRP. We managed to obtain the DiamondClean Smart for £100 off RRP as part of a launch offer, but even then that is still £100 premium. This does not take into account the cost of the brush heads either. Sonicare does offer some innovation here, but as a general rule is commanding approximately £10 per brush head more. Over a typical brush life that is in excess of £100 extra spending on brush heads alone. With even the most creative reasoning this is not justifiable. Roughly speaking the Sonicare will cost 37p per day to own compared to 16p of the Genius 9000. Only you can decide ultimately which brush you should buy. 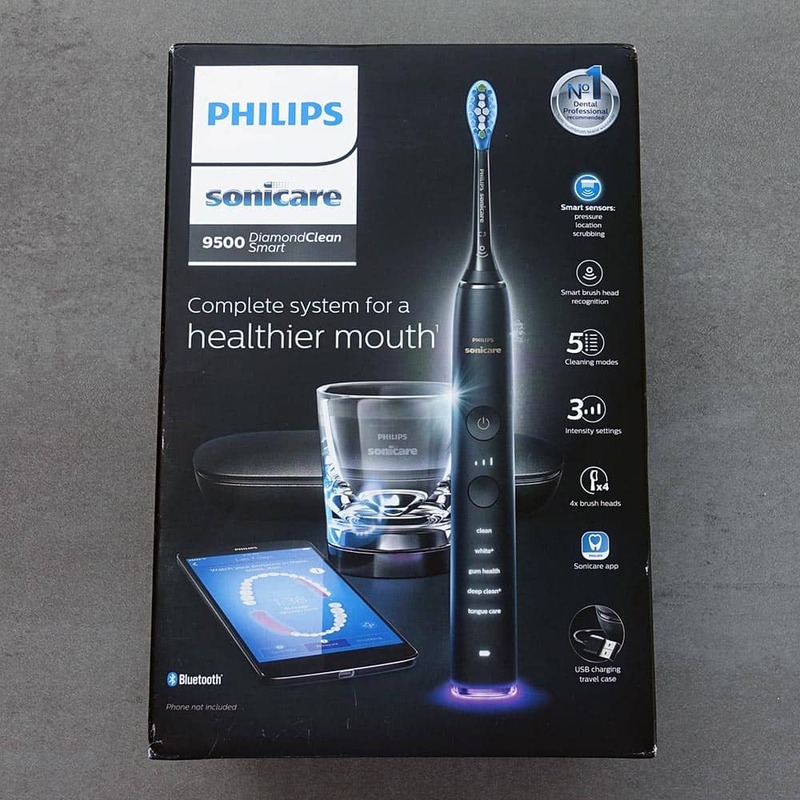 Our intention is to have here presented the differences between two of the most capable electric toothbrushes and given our recommendations based on the information and price at the time of writing. Taking into account this and our hands on reviews you should hopefully be in a position to make an informed purchasing decision. Whilst the Genius 9000 from Oral-B is our ultimate recommendation, overall the DiamondClean Smart is the better brush. If we had to pick up and use one brush everyday, it would be the Sonicare. However, part of owning a brush involves buying it and whilst the DiamondClean Smart offers more value and there is a price to be paid for innovation, it does not offer twice the value of the Genius 9000 which is currently the premium you have to pay to get the ‘better’ brush. On reading this you may have found neither is right and there are many brushes from Sonicare you could consider, maybe you would like to compare these brushes using our toothbrush comparison tool. I have owned electric toothbrushes for many years. Today i bought the Oral B 9000 over the sonic care smart. Sonic care does feel more premium as stated in the article. But ONE SOLE reason other than price i picked the oral B is bcos of reliability. I have had two top of the line sonic care brushes (Non smart versions) before this and they all break within two years. Never drop it. It is very fragile. I dropped my first sonic care from half a meter tall while in bath tub. It didnt break but stopped working later. I never dropped my second sonic care. It still crapped out after almost two years. They dont repair it. They charge u half the money for refurbished models and offering a half year warranty. I am sick of failed brushes so i went with oral b. I feel that oral b makes my teeth cleaner than sonic care. Time will tell if oral b is reliable. Arthur, it is a shame to hear that you have had such issues. Let’s hope the Oral-B works out better for you. Who brushes their teeth while in the bath? ?